MARTINSVILLE, Va — Brad Keselowski led 446 laps en route to his second Monster Energy NASCAR Cup Series win at Martinsville Speedway. 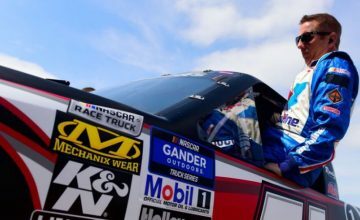 He battled Chase Elliott throughout the 500 lap race but held on for his second win of the young, 2019 season. “It was definitely a slight advantage to being out front, to be able to work traffic your way,” said Elliott, after the race. Chase Elliott led once for 49 laps. Photo by Jonathan McCoy. Kyle Busch finished third, but he said, “You know that was a hell of a lot better day than we probably should have had. “Long runs, I needed long runs,” said fourth place finisher, Ryan Blaney. His car found speed the longer the green flag waved. He challenged for the lead on a couple of occasions Sunday afternoon, but he never did it on a run that lasted less than 50 laps. 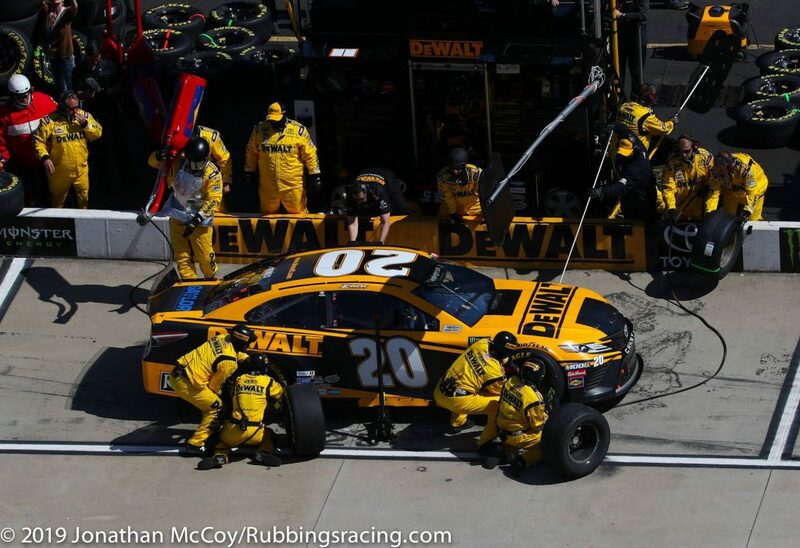 Although Blaney ran inside the top-10 all race he suffered from other struggles, namely issues arising from pit road. 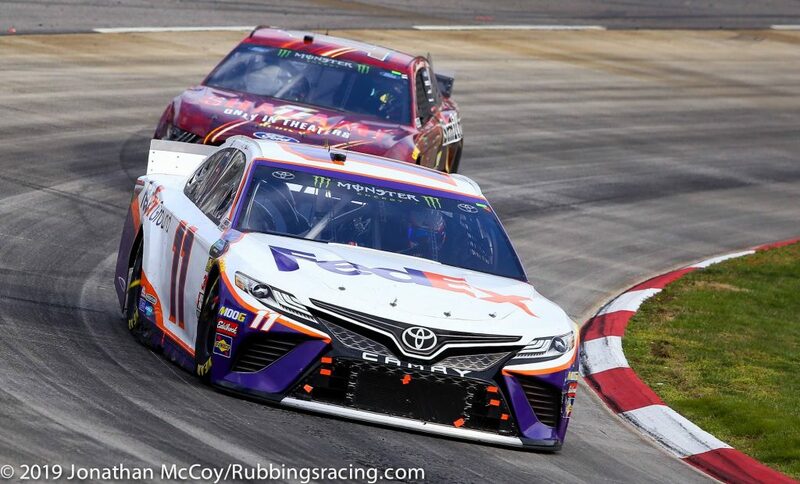 Denny Hamlin lost positions on pit road as well, but unlike Blaney he was charged with a penalty when his team left a tire uncontrolled during a mid-race pitstop. Hamlin recovered to earn his fifth top-10 of the six-race-old season. “When you don’t have the best car you’ve got to pretty much execute perfectly. We didn’t but it didn’t matter because the best car followed through,” said Hamlin. Denny Hamlin rallied from a mid race penalty to earn his fourth top-five in six races. Photo by Jonathan McCoy. Clint Bowyer wound up seventh but many in the media center mused that he had the best car of the race. He would have contended for the win if he hadn’t had two pit road speeding penalties. “That’s such an important thing, such a big part of this style of racing, where track position is everything,” said Bowyer. “We pushed it to the limit. Keselowski bumped his teammate, Joey Logano on lap five to get under him going into turn-three. Logano immediately fell back to fifth, searching for a spot to fall back into the inside lane. Logano fell back to seventh by lap 30. He complained of a loose car, making it difficult to get on the gas on corner exit. Not all drivers had a loose race car to start the race. Blaney, around lap 50, said the track was tightening up as more rubber was laid down into the groove. The first round of pitstops commenced on lap 68 after a lap 66 caution for Michael McDowell. Keselowski maintained his lead when he left pit road, Hamlin fell back to third and Chase Elliott move up one position to second. Laps after the race restarted the teammates found themselves separated by four cars. Harvick was back in ninth while Bowyer drove his way into the top-five. Bowyer snapped a long winless streak in this race last year. Keselowski lead the way to the first stage break. He claimed 10 series points and one playoff point for his feat. Elliott stayed with him the entire way. Over the final few laps Ryan Newman held up Keselowski, giving Elliott an opportunity to try something. Though he didn’t make the pass coming of turn four, he would have if the race had stayed green. A lot of drivers started diamond-ing the corners during this run. As the tires ground rubber into the concrete corners drivers searched for a lane on the track that would give them more grip. Some started entering the turns a full lane up, off the bottom. At about the halfway mark through the corner they would cut the car down and drive straight off. This was a great way to make time but opened the door to being passed on corner entry. “When I try to run up, like that, I get tight at the center and can’t get drive so I can’t make that work,” said Keselowski. Some folks began stuffing there cars as low as they could go, nearly up onto the inside curbing. 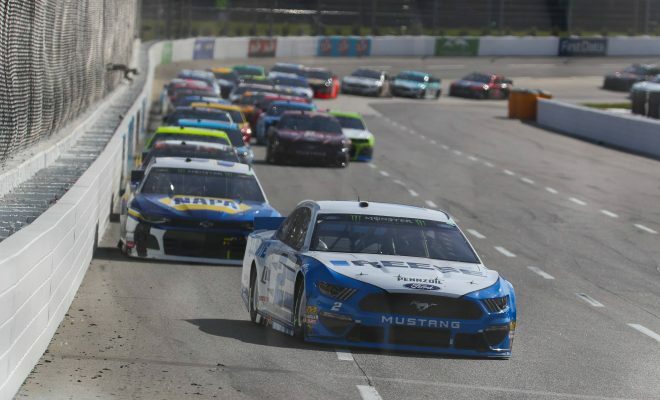 Keselowski was told his teammate was among the best at running that line, with his spotter telling him Blaney was having more patience — rolling through the corner, waiting to hit the gas at the two/thirds mark. Blaney was into the top-five when the second stage started. Who says you see three-wide racing at Martinsville Speedway? Photo by Jonathan McCoy. A few laps after the restart a caution was thrown for debris on the track. Just as the yellow was thrown Elliott slid up, way up the track in turn three. Soon after, spotters began telling their drivers there’s oil on the track. Officially, NASCAR threw the debris caution for a track bar that was laying on the racing surface. None of the leaders came into pit road during this brief, lap 147 caution period. The front five largely stayed the same after the lap 150 restart, but the further back into the pack you looked, the harder the racing you saw. Alex Bowman and Bubba Wallace exchanged contact a few times while racing for fifteenth. Bowman made Wallace squirrelly on the exit of turn-four one lap and then a lap later Wallace paid the favor back in the center of turn-two. 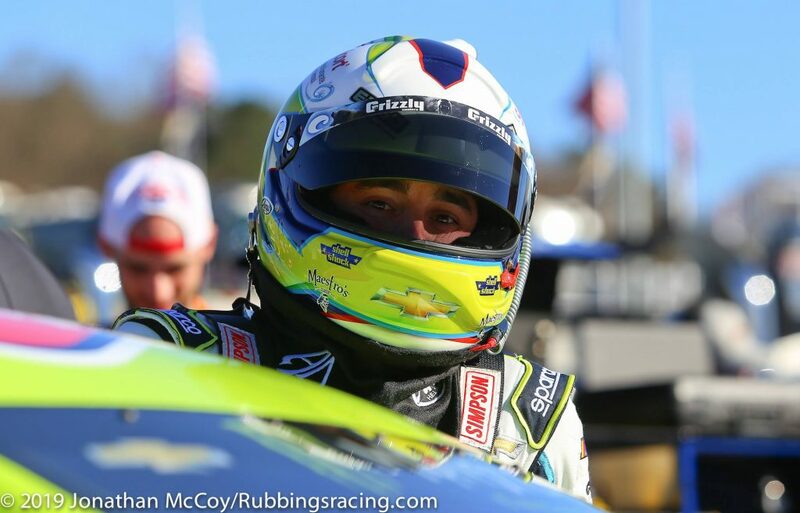 Running inside the top-20 is a good deal for Wallace’s Richard Petty Motorsports. Among the teams with the least funding, RPM has perennially become a back marker. Richard Petty Motorsports used to be a one of the richest teams in NASCAR, but that was decades ago. Teams rise and fall in this sport the same way money comes and goes. When you have it, enjoy it and don’t waste it. Hendrick Motorsports is one of the teams that used to be an absolute behemoth, nowadays the four car organization is lucky to put one Chevrolet in the top-10 every weekend. Elliott is undoubtedly the best performing driver in the HMS stable these days. While he chased the leader on lap 223, his teammates were all more than fifteen places behind him. 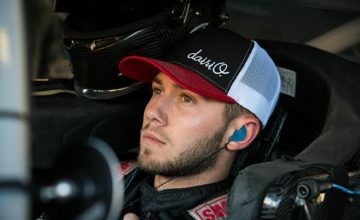 Bowman was seventeenth, elder statesman Jimmie Johnson ran twenty-third, and the youngest of the bunch, William Byron ran twenty-first. 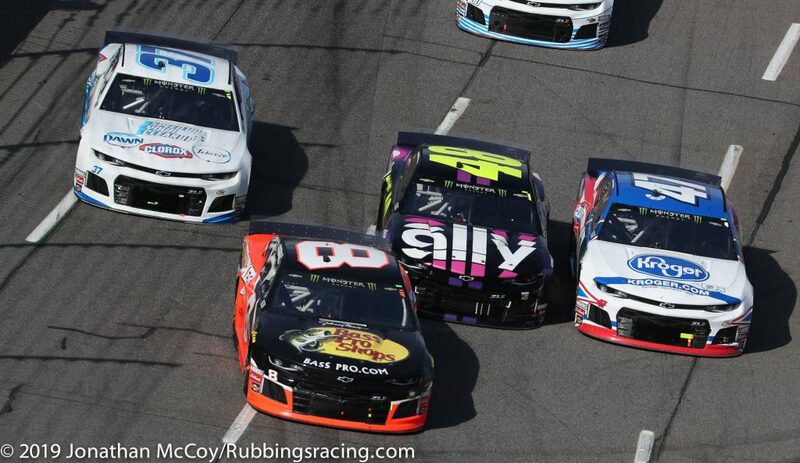 Meanwhile the rest of the mega teams kept all of their cars higher up in the running order: all of Team Penske was inside the top-10, Joe Gibbs Racing had all four cars within the top-12, and Stewart-Haas Racing had its four drivers in the top-10. Using those stats as a metric, it’s easy to posit Elliot is making HMS look better than it is. By the end of the second stage he was the only HMS driver still on the lead lap. Keselowski swept the first two stages of the race. Blaney drove up to second by the end of the second stage and Hamlin drove by Elliott for third. Elliott was fourth and Martin Truex Jr. rounded out the top-five. Hamlin was penalized for his team leaving a tire uncontrolled during the stage break pitstop, sending him to the back of the field for the start of stage three. The ensuing restart was far more eventful than any of the previous. Coming out of turn-two Almirola slowed and stacked up cars behind him. Kyle Busch drove under him and on the entry to turn-three punted Almirola two lanes up the race track. He lost five positions as a result of the incident. Ty Dillon spun out Byron on lap 311. He said he “rolled the center faster” than he anticipated and bumped Byron on the exit of turn-four. Penalties kept coming when drivers went down pit road. During this fifth caution Bowyer was caught speeding on pit road. Meanwhile, McDowell, Chris Buescher, and Corey LaJoie were also penalized for various infractions on pit road. Elliott passed Keselowski on lap 324 and the crowd responded with a ruckus. It was the first time a driver outside of Team Penske led a lap all afternoon, not to mention it was the first lap Elliott led thus far into the season. Nearly right after the pass for the lead, Erik Jones cut down a left-rear tire. The second year JGR driver looked for gaps between cars to get to the bottom lane and bring his car to pit road, but nothing materialized. While riding around on one flat tire, Jones cut a second one. Before he was able to bring his car to pit road he was riding on two rims. Erik Jones ended his STP 500 in thirtieth, nine laps down. Photo by Jonathan McCoy. Elliott put two of his teammates, Johnson and Byron down on lap 367, while his third teammate, Bowman raced his way into the top-10. On lap 370 Matt Tifft slapped the outside wall in turn-two, bringing out the sixth caution. Buescher was the free pass under this yellow. Keselowski passed Elliott on pit road, leaving him to fend for himself on the outside lane. Coming into turn-one on the second lap after the restart Busch gave Elliott a fairly aggressive tap on the left-rear. Though Elliott held onto the position quite a few of his fans instinctively stood up, raised their hands, and a couple were flying the middle finger. Laps later Elliott drove back to Keselowski, diamond-ing the corner to get better speed down the straights. He and Busch closed in on the No. 2 for a period of time, but as the stint dragged on they each began losing touch with him. Blaney passed Elliott for third with 58 laps remaining, but still remained three seconds back from the lead. Ross Chastain had an incident on lap 447, bringing out a caution and forcing everyone to pit road for one last pitstop. Keselowski maintained the lead leaving the pits but Busch, who gained two positions on pit road, made fairly significant contact with Elliott. Had it been a downforce track this small bit of damage would have been detrimental to them both. However, drivers complained about the effect the eight inch spoiler had on the wake of air behind cars. 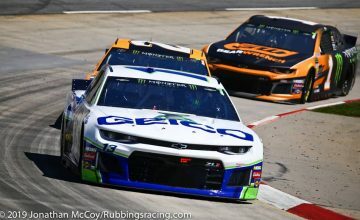 Yes, drivers felt that the aerodynamics played a larger role than normal at Martinsville Speedway. The race was still a great show, and perhaps Martinsville will always be entertaining — no matter what the race package is — but it’s still burns nerves to hear dirty air was a factor at the Cup series shortest track. Keselowski and Busch restarted together on the front row on lap 455. The pair of drivers have been rivals for most of the past 10 years. If you’re looking for a quintessential NASCAR rivalry look no further than these two. It was a clean restart, but all eyes were on them when the race restarted with less than 45 laps to go. Busch tried to get to Keselowski’s bumper but lost his momentum and let Elliott go by. Elliott was after Keselowski from then on out. Within laps he was knocking on his rear bumper every turn. Busch couldn’t keep it up though. If he rode Keselowski’s bumper he would burn up his brakes. Busch came back to Elliott and made it a tried and true three-car battle for the lead. It was the best driver combination NASCAR could hope for at the end of the race. Elliott is famously labeled the people’s champion, and everyone has an opinion on the Busch/Keselowski rivalry. With fifteen to go it was still the three of them going at it, although the delta between the trio had grown to nearly a full second. Elliott arced his car high through the entry of the corners and tried to drive straight off, but he just didn’t have what it took to get back around him.